From the dawn of the human race, we’ve stood in awe of nature. There’s still nothing like nature to lend mysticism, drama, and awe to an event. Perhaps that’s why you’re joining the rising trend of people choosing a barn for their wedding venue. If so, you may not have the same kind of resources on hand to help you decide how to deck out the venue as you would for a traditional wedding. We’ve got you covered. Here are 10 rustic barn wedding ideas to take you back to nature. One of the difficulties of a barn wedding can be the overwhelming space available. That’s where curtains can help to cut a barn into smaller areas, creating more intimate spaces within the larger area. And if you already have curtains in play, then drapes are an excellent way to carry that aesthetic through to the rest of your decor. Neutral colors can emphasize the barn’s rustic interior without distracting from your back-to-nature look. There’s something about jars that lean right into the aesthetic of a barn wedding, perhaps because a farmhouse and its storage jars are both so evocative of rural living. The decorative uses of jars are already widely acknowledged, so consider using a few of these to give a homemade flair to your wedding decorations. You can do everything with jars from using them for lighting to serving drinks in them, so the ideas are endless. If you’re going for the atmosphere of a barn, then it would be a shame to drown it out with industrial-grade lighting. A barn wedding should be a low-tech and intimate affair, so consider subbing out some of your electric lighting for cozy candles. You can pair this idea up with jars, for instance, turning them into the perfect candle-holders to light your dinner tables. Just be aware of any fire safety concerns that may go along with your candles! You don’t want your wedding to become a literal barn-burner. Of course, candles do lack the output of electric lights, and they’re not practical for lighting a whole barn. That’s where fairy lights can pick up some of the slack. Fairy lights, despite their modernity, still carry old-world charm. Perhaps that’s why we use them to decorate trees. Their subtlety and ability to highlight, rather than distract, are perfect for a barn wedding. Consider wrapping fairy lights around the barn’s beams and rafters to provide a charming atmosphere. There’s an unbreakable association between a barn and nature. So lean into it by decorating your space with garlands and wreaths. The best part about using these decorations is that they’ll slot in almost anywhere without distracting from the proceedings or becoming too much of a burden to put in place. Not sure what to do with a door? Wreath. Exposed rafters? Garlands. They’re versatile enough to play almost any role in your decorations, so consider throwing a few in whenever you’re at a loss. It’s not all about what you stick on the walls, of course. Your fashion choices also tie into the overall look of your wedding. You don’t need everyone in cowboy hats for a barn wedding (though you can if you want), but a few rustic touches can go a long way. Small touches like rustic lapel pins for men and flower adornments for hair can really tie things together without going too deep into the country vibe. When you have an urban wedding, it’s easy to dismiss the outside as a lost cause thanks to other buildings and roads. But not so with a barn wedding. If you have a barn as your venue, it’s almost a shame to neglect the use of the outdoor space. Humans have always looked to nature when we celebrate, from garlands and wreaths to Christmas trees. So give your day a flavor of ancient traditions by using your outdoor space. Try setting up a makeshift bar outside, or even having your first dance there, if the weather will be clement. Encourage guests to head out of the barn by placing barrels for tables and stools for seating in the outdoor space, and leave the barn doors open. Twenty years ago, it would be unthinkable that “wooden pallet” would share a sentence with “decoration”, but we’re living in an innovative time. A barn wedding is one of the venues that can elevate a humble transport structure into an element of interior design. But pallets have incredible versatility for a barn wedding. They can serve purposes ranging from backdrops to serving tables or even become a space for a schedule or notice board with some cunning use of the slats. 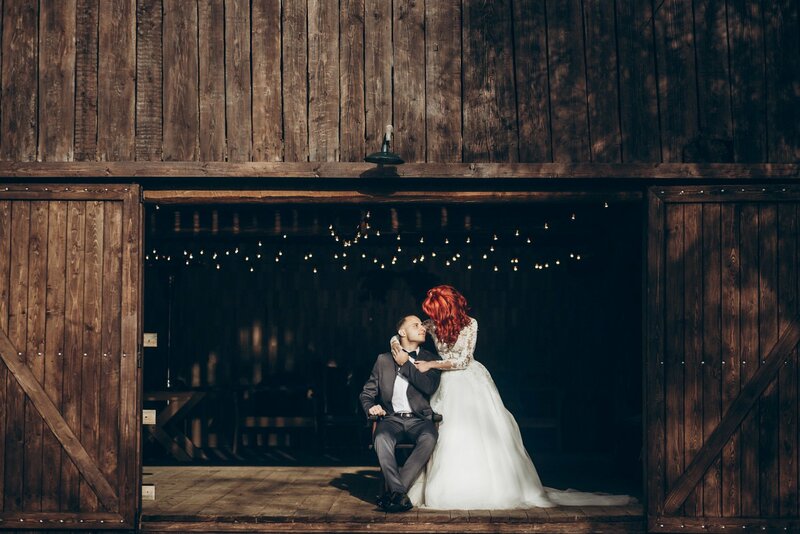 A barn wedding is a non-traditional spin, so why not lean into it? Naked or semi-naked cakes have become a popular way of breaking from the mold while still ensuring the wedding cake plays a traditional role. Naked wedding cakes work so well with barn weddings because they both conform to a rustic, down-to-earth and pared-back aesthetic. As a centerpiece, it can do a lot to bring the whole look of your barn wedding together. If you’re recapturing the feel of a world gone by, then picnic benches are the perfect way to promote a social atmosphere and dispense with the formality of a traditional wedding. Benches also go great with every other item on this list — you can light them with candles, fairy lights, or set them outside, which will all help to tie the theme of the wedding together. These 10 rustic barn wedding ideas will help you reconnect with nature without dispensing with the memory-making decorations of your wedding day. But the best part of this is that rustic decoration can even lead to you spending less on your big day. Still pricing up your wedding? You can find our venue pricing here.